If I've seemed rather quiet recently, it's because I've been slaving over Scrumptious News, my new venture. 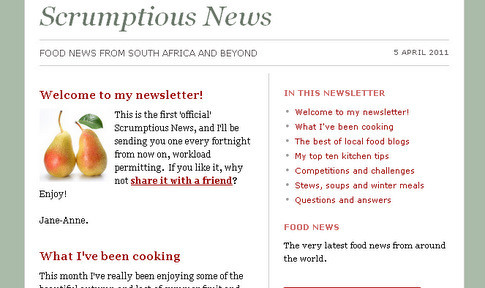 Scrumptious News is an email newsletter delivered free to your inbox every fortnight or so, containing the freshest food news from South Africa and beyond. 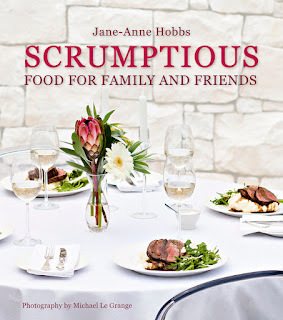 I'll be featuring the very best of local food blogs, interesting foodie news, a miscellany of fabulous recipes, and some top kitchen tips and hints. 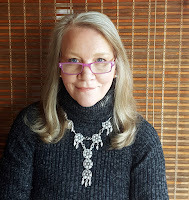 I'll also be offering you an assortment of links to all sorts of worthwhile sites - food competitions and recipe challenges; cooking classes and demos; hot new international trends; inspiring recipes from celebrity chefs, and snippets of fascinating food-related and fine-dining news from all over the Internet. Interested? I hope so. I'm asking you to support my new endeavour, and hope that you'll send me your comments, suggestions and queries. If you'd like to receive the newsletter free in your inbox, please add your email address to the form at the top left of this page. You can unsubscribe at any time in a single click. If you'd like a preview of my Scrumptious Newsletter, here are links to two preliminary (and experimental!) newsletters I've sent out recently to food bloggers who requested them. The latest letter - which you can view here - contains an editorial style sheet for food bloggers, and much more, including: how to spell food words; helpful tips for measuring quantities for recipes; keyboard shortcuts for fractions; and a list of American equivalents for common South African ingredients. The newsletter before that (and I apologise for the rather chaotic template, which I have since changed to a simpler, cleaner, quick-loading format) can be viewed here. 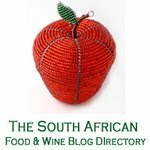 This email contains notes from the speech and the workshop I presented at the recent South African Food Bloggers' Indaba, and features advice about food writing, food blogging and recipe development, plus tips about recipe formatting and style. I'll be archiving all these newsletters on this blog, so you can browse them at your leisure. Wow this is fantastic! I have been a fan of yours for ages but this is a new dimension that is great! I can just imagine how many hours of hard work it has taken. When I am in Cape Town I would love to meet you as this blogging is a lot more involved than I ever imagined! Let me try again to leave a comment! Thanks and congratulations on a wonderful and interesting newletter! Good luck with this. 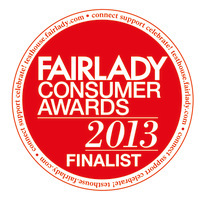 I hope there will be many more! Thanks Lisa-Jane and Pinky! I've left a comment on your blog, Lisa-Jane.